No to long ago I sat in my chair in the studios while doing “The Still Real to Us Show” proclaiming that I felt that Roderick Strong should not be the next ROH World Champion. At that time the stars were aligned for Roddy to become the new ROH World Champion. Tyler Black, who at the time was the current ROH World Champion; had signed a WWE Developmental deal and the September 11th ROH Glory By Honor IX iPPV would be his last appearance in Ring of Honor. At that September 11th show Tyler was set to battle Roderick Strong for the ROH World Championship, a feud that had been made 7 months in the making dating back to Black’s title victory at ROH’s 8th Anniversary Show in New York City. Sure ROH could have swerved us wrestling fans and had Black drop the title at any of the three house shows leading up to GBH IX, but they did not. Sure they could have had Tyler Black drop the World Championship on their HDNet shows on Monday night, but they did not. It was poised to be Roddy’s time come 9/11 at the Manhattan Center for Glory By Honor IX. Tyler Black and Roderick Strong would battle in the Main Event of Glory By Honor IX with the ROH World Championship on the line and Terry Funk becoming the eventual referee. As expected the departing Tyler Black would drop the ROH World Championship to Roderick Strong that night. After six years in Ring of Honor Roderick Strong was finally the World Champion. At first I wasn’t convinced that Roddy should be the World Champion, I even said on my wrestling podcast that I just couldn’t see it happening, hell I was saying it at the Glory by Honor IX event itself. For some reason it just didn’t click in that Roderick Strong should be the ROH World Champion. It was nothing against the person or the wrestler Roderick Strong; it was just that I wasn’t sold on it. The moment I was sold on it was during the Black/Strong match itself and it finally clicked in when they put the World Championship around Roderick Strong’s waist. It was then when I felt that Roderick Strong deserved his chance in the spotlight, deserved that shining moment in Ring of Honor to be named its World Champion. 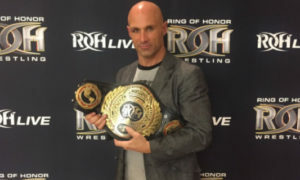 One of the few ROH veterans left in the company finally getting his chance to hold the gold. Obviously Strong’s reign will be put to the test the next couple of months and determine what kind of success he will have as a heel World Champion. ROH is definitely setting up Roderick Strong to carry the gold into the next iPPV in New York City in December, Final Battle 2010. Who that will be against no one knows right now with the exception of Davey Richards getting a title shot. If I had to put money down on the Main Event prediction I think we are looking at a Strong vs. Richards vs. Homicide vs. Christopher Daniels main event in December to close out 2010. Most Ring of Honor World Champions have a good amount of longevity in their title reigns and it would appear this would be the way the company will be heading once again as the final part of 2010 will belong to Roderick Strong. There is a lot of momentum riding on the side of Roderick Strong as he enters his first run as a World Champion as Ring of Honor is quite possibly coming off of one of it’s biggest breakthrough shows in it’s tenure as GBH IX has received many high reviews from wrestling fans including this one. 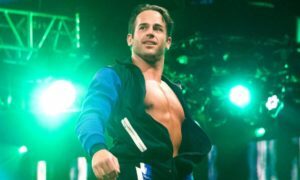 So if it were the case where ROH has reached out to newer wrestling fans in the last couple of weeks it will be the face of Roderick Strong that will carry this company to potential new heights. It will be a potentially stressful time, as I believe it is for most World Champions in any wrestling company, as the growth of a company during your reign is a complete reflection of you the wrestler. I hope Roderick Strong does well, I feel many people have casted him as someone who could be a transition champion to Davey Richards. Strong could surprise all fans of Ring of Honor in the next couple of months leading up to Final Battle 2010 as being a good & entertaining World Champion. For the time being I feel like we can all trust in the ROH veteran Roderick Strong to continue to lead Ring of Honor to new & unbelievable heights. What are your thoughts on Roderick Strong as the new ROH World Champion? Tell us your thoughts on “The Still Real to Us Show” by e-mailing us over at [email protected] and give us your thoughts on whether you agree with more or not! Then go ahead and download the show this Thursday @ 8pm ET/5pm PT at www.wheelhouseradio.com or www.wrestlechat.net to find out if your pick made it to the air!